Off the Wall is the fifth studio album by American singer Michael Jackson, released on August 10, 1979 in the United States by Epic Records and internationally by CBS Records. It was his nineteenth album in total since Diana Ross Presents The Jackson 5 (1969), as well as his first album released through Epic Records, the label he would record on until his death roughly 30 years later. It was released following Jackson's critically well-received film performance in The Wiz. While working on that project, Jackson and Quincy Jones had become friends, and Jones agreed to work with Jackson on his next studio album. Recording sessions took place between December 1978 and June 1979 at Allen Zentz Recording, Westlake Recording Studios, and Cherokee Studios in Los Angeles, California. Jackson collaborated with a number of writers and performers, such as Paul McCartney, Stevie Wonder and Rod Temperton. Five singles were released from the album; three of the singles had music videos released. Jackson wrote three of the songs himself, including the number-one Grammy Award-winning single "Don't Stop 'Til You Get Enough". The record was a departure from Jackson's previous work for Motown Records. Its lyrical themes on the record relate to escapism, liberation, loneliness, hedonism and romance. Several critics observed that Off the Wall was crafted from funk, disco, soft rock, jazz, Broadway and pop ballads. Jackson received positive reviews for his vocal performance on the record. The record gained critical acclaim and recognition, and won the singer his first Grammy Award. With Off the Wall, Jackson became the first solo artist to have four singles from the same album peak inside the top 10 of the Billboard Hot 100. The album was an enormous commercial success; as of 2014 it is certified eight times platinum in the United States and has reportedly sold more than 20 million copies worldwide, making it one of the best selling albums of all time. On October 16, 2001, a special edition reissue of Off the Wall was released by Sony Records. It was re-released on February 26, 2016. Recent reviews by AllMusic and Blender have continued to praise Off the Wall for its appeal in the 21st century. In 2003, the album was placed at number 68 on Rolling Stone list of "The 500 Greatest Albums of All Time". The National Association of Recording Merchandisers listed it at number 80 on its list of the "Definitive 200 Albums of All Time". In 2008, Off the Wall was inducted into the Grammy Hall of Fame. "Don't Stop 'Til You Get Enough" – The future releases feature the 7" single edit. But in the 2016 re-issue feature a different instrumentation and louder vocals. "Rock With You" – The full length remix used for the original release was replaced with a new version with the strings lowered down and the drums kicked up. "Get On The Floor" – The same with Rock With You but the ad-libs are toned down as long as other instruments lowered down. "Girlfriend" and other tracks were replaced with their repesctive single edit in other versions. Does anyone's copy have different or missing instruments? Like the guitar and handclaps on Rock with You or the guitar riff on Get on the Floor. Is this how the original mix sounded? Does anybody know the exact date of release of this printing (with SONY logo changed on 1.1.2009)? This vinyl is the crown jewel of my collection. Next to it being my favourite Michael album, the pressing of this release is something I have not heard before or since. I actually don't know what more can I say. Do yourself a favour and purchase this press. This is the vinyl I put on my turntable to close the mouth of someone who dares to say that vinyl doesn't sound as good as CD. Well, I own FAR more CDs than vinyl and I never heard something like this. Hello everyone, can someone tell me if this vinyl is in 180g format? thanks. Warm sound and good dynamics. Definitely a great pressing and well worth the low cost. What's really, really annoying is the amount of people selling this limited album (that is supposed to come with a picture disc) WITHOUT the all important disc! At low prices. They're not selling the item that is featured in this submission, merely the edition without the picture disc. Result? Artificially low average selling prices within that listing. Bad, bad practice. I wonder, just how many of the items sold under this submission were actually the original orange UK Epic label issue, with the yellow cover sticker and including the picture disc? Not many I'll bet based upon the fact that the listed prices are low and this album edition is rare! NONE repeat none of the ones currently for sale in this section include the picture disc. None. Often mistaken as Michael Jackson's debut solo album (or at least... it was in the pre-internet days... how did we ever cope back then? ), 'Off The Wall' was the first big label release in which the future pop icon had really separated himself from his brothers and former bandmates The Jacksons, previously known as the Jackson 5, and the Motown Records label. Michael Jackson was my first ever musical inspiration. My first "favourite artist". From a very young age I was captivated by his music and showmanship, and while I had some of his albums on cassette tape and vinyl, it was 'Off The Wall' that was one of the first CD's I ever purchased. Though, after the initial hearing, it took me about 20 years to come around to listening to it properly. My musical tastes have grown and varied a lot over the years, but no matter how old it gets, that funky 70's disco vibe will always be as infectious now as it was back then! While the music isn't as adventurous as later material, it's still a solid progression from the Jackson 5/Motown days, and shows Michael's talent as a performer, a vocalist and a songwriter. With some of his early hits such as 'Don't Stop 'til You Get Enough', 'Rock With You', 'Off the Wall' and 'Burn This Disco Out', there's plenty of groove-laden tracks to get your body moving when you least expect it. And then there's what I consider the true gem of this album, and one of Jackson's more underrated tracks, 'Get On the Floor'. Check out that bass line! Sadly, there's also a few rather mundane tracks that are "just there". In particular, soppy love ballad 'She's Out of My Life' is a real drag. 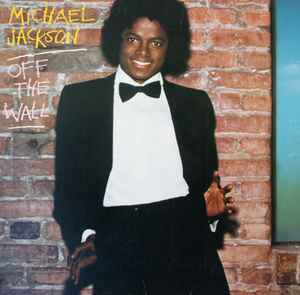 Overall, 'Off The Wall' is the album that solidified Michael Jackson as a solo artist, and shows a maturity far removed from his "child star" days. And while it's far from his best work, it served as a tremendous outing to show the unlimited potential he possessed at such a young age, and would most definitely lead on to better things. This pressing is the one that woke me up to just how good vinyl can sound, many, many years ago. I don't even think my turntable at the time was remotely good enough to pick up all the nuances, but it didn't matter. There's something magical about the mastering, you can notice it especially well in "Rock With You" where the percussion and vocals are sharp without the sibilance being overdone - clear as can be. Highly recommended for any MJ fan, whether you have a good deck or not. The source mastering is just that good. Are you sure that the catalog number is correct? My "Fuera de la Pared" edition has 120.509. Can anyone comment on the quality of this pressing's mastering? Is it exactly the same as the Special Edition CD or is it more dynamic?